Mr. Audubon's paintings are pretty great; I'll vote for him. I think it's going to be a near blowout here, Audobon. Audubon. Other guy makes me think I need glasses. Citing "bad colors that make me want to vomit," Parsons awards Auerbach a D+. Yeah, Audubon has my vote also. Kudos for sneaking in Thanksgiving Day content with the wild turkey. In my house, I'd rather hang an Audubon. 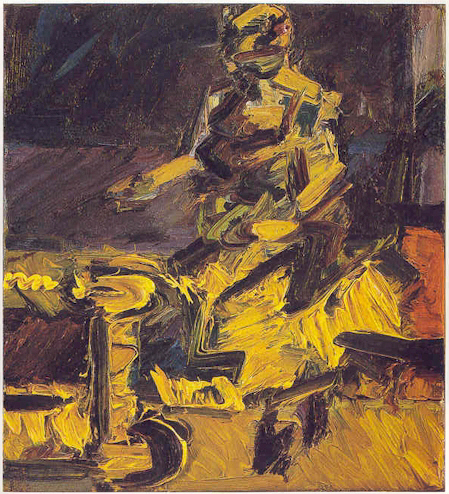 There's something oddly compelling about Auerbach's use of color (when he uses it), texture, and fractured space. I don't like all of his work, but it's certainly interesting stuff, and some of it is really, really neat (http://venicebiennale.britishcouncil.org/people/initial/a/id/178/image/932 and http://venicebiennale.britishcouncil.org/people/initial/a/id/178/image/931), so I'm going to give him a vote, poor guy. I like the first one of these two best. 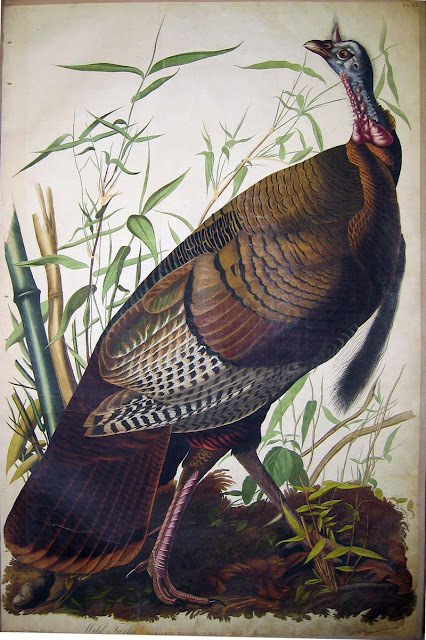 I once wrote a book review of a biography of Audubon for an actual published magazine, and what made the greatest impression on me is how the passionate naturalist, with an unquenchable hunger for specimans, blazed his way through the North American wilderness like a one-man slaughterhouse. Kind of a metaphor for, well, whatever. His paintings are lovely. 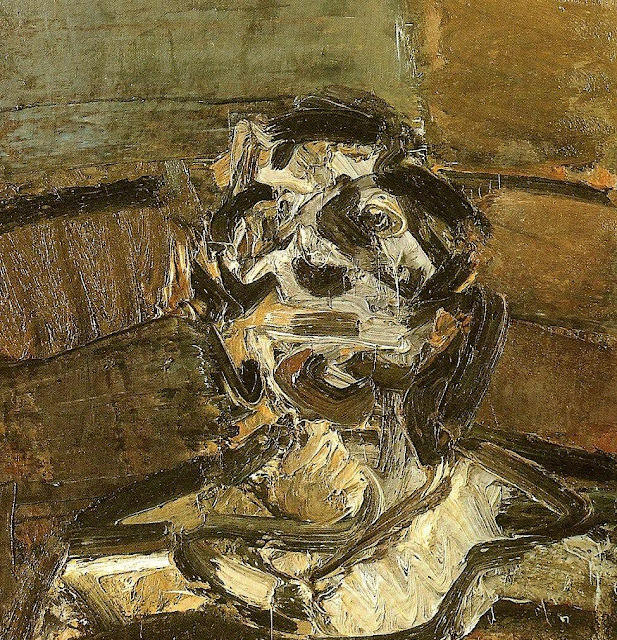 Nevertheless, I am going to surprise myself and join Mr. X in the pity vote for Auerbach, whose bold brushwork and kinetic energy seem more interesting to me than Audubon's perfections, which always seem to me to shoot past realism towards a sort of poised surrealism. I'm going to go with Mr. Audubon. gets my vote. His paintings are so alive. First, this is like comparing apples and oranges. Second, one must possess imagination to appreciate Auerbach. His work in person is stunning. He is known for his sensuous brush strokes...which is underserved my a computer monitor. My vote is resounding for Auerbach, although I'm not at all surprised that most chose Audubon. How did these two even come to be compared?? Were you flipping through an art collection book arranged in alphabetical order? First, yes, it is much like comparing apples and oranges. They are different things, but in that they are both similarly sized tree fruits, they are much, much more similar to each other than they are to almost all other things. On this basis, it is very reasonable to compare them, as in fact people do all the time. I used to prefer oranges, myself, but apples have been growing on me lately. Second, as you well know, one must possess imagination to appreciate any work of art; your boy has no monopoly on this. Obviously, a computer monitor is a limitation for this kind of exercise -- especially for the sculpters -- but we ARE on the internets, so we sort of have to live with the medium. These two came to be compared because they are bracketed against each other in the tournament which, yes, is seeded by alphabetical order. 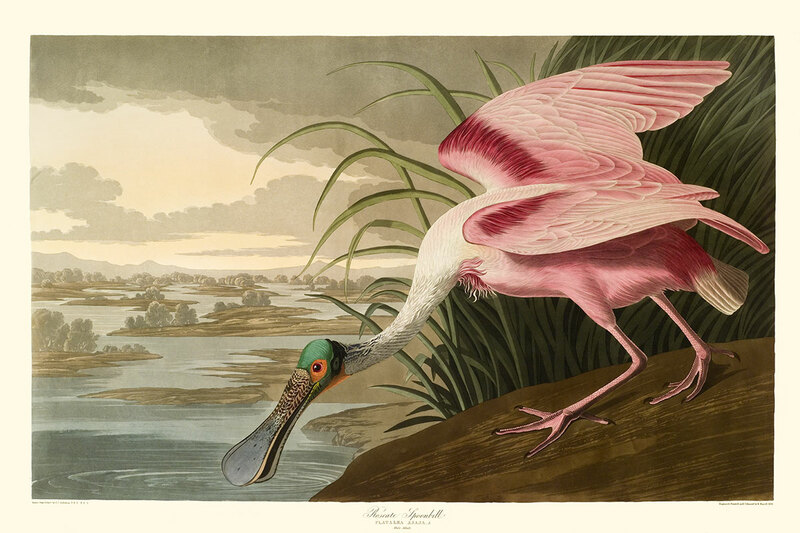 Now, polls are long closed on this one and Audubon is already out there duking it out with Francis Bacon in Round 2. You can support Auerbach in the loser's bracket in a couple of months, if you want, but you'll have to give yourself a handle for the purpose; I'm not going to count purely anonymous votes in the tally.